Definition at line 72 of file CModelMerging.h. Definition at line 85 of file CModelMerging.h. Definition at line 932 of file CModelMerging.cpp. Definition at line 1219 of file CModelMerging.cpp. References CKeyFactory::get(), CCopasiObject::getCN(), CCopasiObject::getKey(), CCopasiRootContainer::getKeyFactory(), CEvaluationTree::getNodeList(), CCopasiContainer::getObject(), CEvaluationNodeObject::getObjectCN(), CCopasiObject::getObjectDataModel(), CCopasiObject::getObjectName(), CCopasiObject::getObjectParent(), CCopasiObject::isReference(), mpModel, CEvaluationNode::OBJECT, CEvaluationNodeObject::setData(), CEvaluationNode::type(), and CEvaluationTree::updateTree(). Definition at line 989 of file CModelMerging.cpp. References CModelEntity::ASSIGNMENT, CModelEntity::FIXED, CReaction::getChemEq(), CModel::getCompartments(), CModel::getEvents(), CEventAssignment::getExpressionPtr(), CModelEntity::getExpressionPtr(), CReaction::getFunctionParameters(), CModelEntity::getInitialExpression(), CModelEntity::getInitialExpressionPtr(), CModelEntity::getKey(), CChemEqElement::getMetabolite(), CModel::getMetabolites(), CModel::getModelValues(), CChemEq::getModifiers(), CReaction::getParameterMappings(), CChemEq::getProducts(), CModel::getReactions(), CModelEntity::getStatus(), CChemEq::getSubstrates(), CEventAssignment::getTargetKey(), mergeInExpression(), CFunctionParameter::MODIFIER, mpModel, CModelEntity::ODE, CFunctionParameter::PARAMETER, CFunctionParameter::PRODUCT, CModelEntity::REACTIONS, CChemEqElement::setMetabolite(), CEventAssignment::setTargetKey(), CFunctionParameters::size(), CCopasiVector< T >::size(), CFunctionParameter::SUBSTRATE, CFunctionParameter::TIME, and CFunctionParameter::VOLUME. Definition at line 937 of file CModelMerging.cpp. Definition at line 942 of file CModelMerging.cpp. 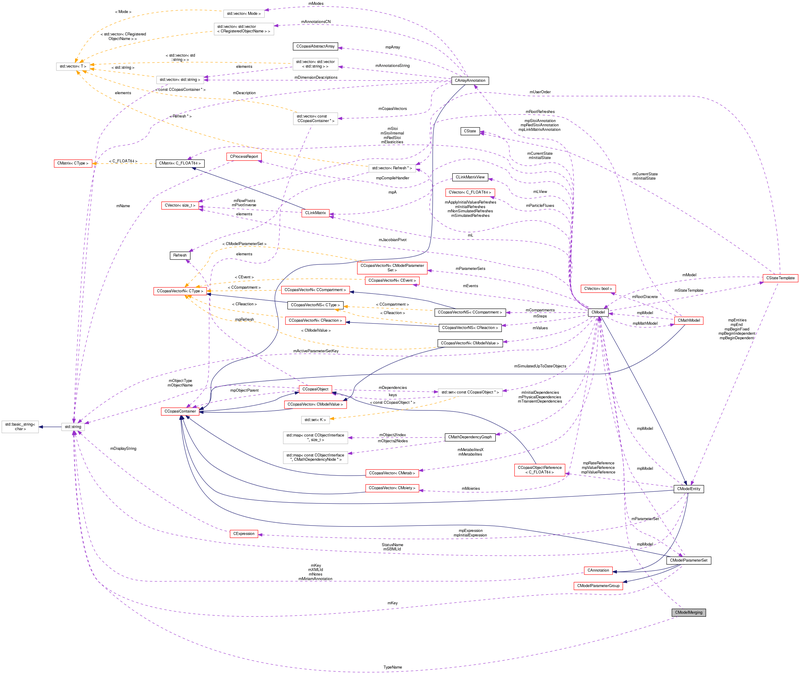 References CModel::compileIfNecessary(), CCopasiMessage::ERROR, fatalError, CModelEntity::getKey(), CModel::getMetabolites(), CCopasiObject::getObjectName(), MCModelMerging, mergeMetabolites(), mpModel, CModel::removeMetabolite(), and CCopasiVector< T >::size(). Definition at line 102 of file CModelMerging.h. Referenced by mergeInExpression(), mergeMetabolites(), setModel(), and simpleCall(). Definition at line 95 of file CModelMerging.h.